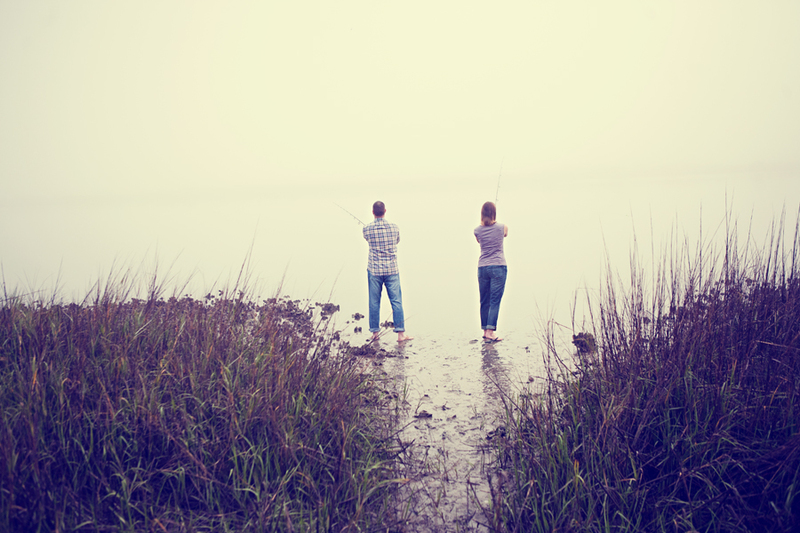 Karen and Nate love to be in nature and often go fishing. In fact, when Karen and I were brainstorming ideas for their session, she said that they used to joke how she should have her own fishing show called “Reel Time With Reamer” (her last name is Reamer). Later, Nate surprised her with a shiny new fishing pole engraved with the same phrase. Thus, our fishing themed session was born. We gathered a bunch of fun props and headed over to the Salt Run at Anastasia State Park. They weren’t afraid to get their toes dirty! Karen and Nate were also long distance for part of their relationship so we thought it would be fun to tell that part of their history with a prop series showing their home states, their many phone calls, and finally the love they now share as they are about to be husband and wife. We hope you enjoy!